FUSION Electronics is excited to introduce the impressive 600 Series Marine CD Stereo, capable of playing CD/MP3. Listen to your favourite CD, radio station or satellite radio station. Delivering a new modern styling and enhanced remote bus technology, the 600 series is an evolution on the award winning features found in the 500 series. Incorporating an intelligent user memory, FUSION's latest Alpha Search Technology and extended Apple iPod support with fully integrated iPod user interface, dual mono subwoofer output and ingenious behind dash engineering all contained in a 100% aluminum chassis. True 360? Waterproof design: Complies with IPx5 Waterproof standards, which includes full behind dash water protection. Innovative multi-zone control: Fully adjustable volume control in all zones of the vessel. Have loud music in the cockpit & quieter music in the saloon. User friendly: User interface is intuitive & simple to use while the recessed backlit keypad is large enough to view & operate in the roughest conditions. Advanced power saving: High output efficiency and low battery drain through the latest D-Class Amplifier technology. True integration for iPod: Complete iPod integration & control is provided via a replication of the iPod menu on the stereo display, allowing simple & easy navigation. Superior die-cast construction: Engineered to withstand the harsh marine environment including salt spray, humidity and pounding seas. 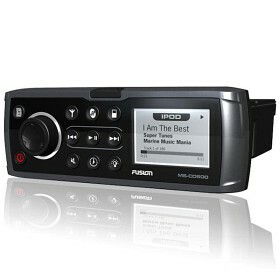 Superior display: Large backlit LCD with adjustable brightness allows for accurate display of the iPod and Sirius interface.